Want to take a holiday near Mangalore or Udupi? Wondering if there is some idyllic location for such a holiday? Then just 6-8 km away from Udupi you can take a holiday at Malpe beach. In this article, read about Malpe beach Udupi, how to reach and what to do there. If you are planning a two-day holiday, then this article will provide you information about other attractions nearby this place right in Karnataka, within two hours reach from Mangalore. Beaches are popular locations for spending mornings or evenings. Beaches are local and tourist attractions for all ages. There are ample things to do on the beach. If you are a nature lover, then the view of the never ending stretches of sand and water is always a relaxing experience. A walk on the beach is an escape from the daily stress and boredom of routine life. Beaches are ideal picnic spots for family and friends. You can head to the Malpe beach Udupi and watch its exemplary islands and waters, and get a complete break from your routine work. 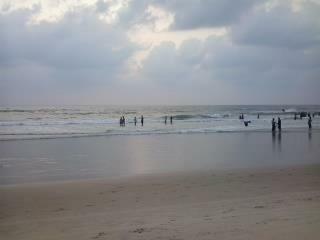 I had taken a two-day holiday at Malpe beach with my daughter who was studying at Manipal. I took a flight from Mumbai while she came in from Manipal. It was a wonderful weekend break for both of us. The stay at Malpe was beautiful, scenic and relaxing, and memories of this holiday will remain with me for ever. Did you know that Malpe beach offers you a free 30-minute wifi facility on your phone? This facility was commenced from 25th January 2016. This was our main attraction for the two days holiday. 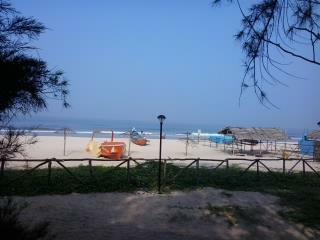 Malpe beach ,called a virgin beach because its natural beauty is yet untouched. It is a clear stretch of golden brown sand and turquoise blue waters. Locals and tourists throng this place on the weekends. The beach is accessible from the road within 5 minutes. Auto rickshaws and buses ply along the highway frequently. The beach is suitable for swimming. Tourists and locals are found here more on weekends. Along the beach, you will find palm trees. stand below the trees and check out the blue waters and the blue skies. The scene is a perfect picture to be stored in our memory forever. Children will enjoy building sand castles while the elders may lie on the sand and enjoy the natural splendour with cool sea breeze from the sea below the shade of the palm trees to your heart's content. The Udayavara river, or the Malpe river as it is commonly called flow around the beach into the sea. The water is quite clean and you can see your feet clearly in it. Depending on your mood, you can decide what to do on the beach. Take long walks early morning, later evening and post-dinner walk on the beach, below the star, lit sky, and the sea stretching as far as the eyes could see. Take a swim in the water, or play in the sand or just lie on the beach and enjoy the cool sea breeze. Enjoy water sports on the beach, or take a boat and do fishing or angling. Take a jet ski and feel the sea spray on your face or take a dip in the sea with a banana boat, or fly in the sky with parasailing. Also, check out camel rides and quad bike rides on the beach. These are reasonably priced. Ever tried kite flying? Check out Malpe beach for kites of various shapes, sizes, and colours which crowd the evening skies. Kites are handmade by locals and reasonably priced. The holiday at the beach was a tryst with nature, and each moment was etched in memory forever. Malpe is a natural port and the largest one in the state. It is also a fishing harbour and has a ship building yard. People of Malpe belong to the Magaveera community and are well off being either businessmen and fishermen. Tile making and coconut industries are also thriving in Malpe. The place is also known for TEBMA ship building company. The languages spoken in this area are mainly Tulu, Kannada, and Konkani. Hindi is not very common but you can get your message across. People are helpful in giving directions. Malpe beach is located about 6 km from Udupi, and 55 km from Mangalore in Karnataka. It is just 5 km from NH 17. The region is well connected by general modes of transport like train, air , and roads. The nearest airport is located in Mangalore while the nearest railway station is in the town of Udupi. The roads are well connected to Malpe through Udupi, Mangalore, and Bangalore. In all, Malpe is reachable and you need not depend on your own rental car or taxi for this holiday. Rains are heavy and the tides will be erratic. Hence the best time period to visit Malpe beach or take a holiday is between October and December. The beauty of the beach is best enjoyed early in the morning or nearing sunset. You can plan a day trip to nearby attractions so that you can enjoy the sunset on the beach. If the rains are just round the corner, then be careful to carry an umbrella or a light windcheater. Though there are no mosquitoes, keep a repellent handy nearing the rainy season. There are many hotels that provide accommodation in Malpe and the tariffs will be available as per your needs as there are both budget hotels and star hotels in the place. The cuisine in this area is mostly seafood but there are many other dishes which can be relished. We stayed for two days in an Eco resort right on the beach. It was a tent accommodation, very simple with all utilities but comfortable. The resort did not have any fancy metal barriers,and the verandah had beach chairs and hammocks. After dinner, we had a relaxing lie down on the hammocks with the sea breeze soothing our nerves. The dogs on the beach were there to guard us all through the night. The place was safe even though we were only two females who had booked this place. Be it the islands in the Arabian Seas or the backwaters or the temples, Malpe offers several interesting attractions including several islands in the vicinity and temples. Islands: It is an amazing experience to take a boat ride and watch these islands from up close. The Daria -Bahadurgad island is the northernmost island having a fort which was built by Basavappa Nayaka of Bidanur. On the southern most side is the Kari-Illada-Kallu island.while Daria-Gadara-Kalluthe is situated between the northern most and the southernmost region. St Mary's island is a geological monument declared by the Geological Survey of India in 2001. The island is also called Thonse Par and is a very popular attraction among tourists., known for vertical and hexagonal volcanic rocks. Did you know that Vasco-da-Gama landed on this island in 1498? The northern part of the island has a coco nut garden which gives the island a green color and provides shade to all the visitors. Temples: Apart from the beach and the islands Malpe is known as a pilgrimage desitnation. The Balarama temple built by the Mogaveera King Maindan and the Ananteshwara temple are located in Malpe and frequented by tourists. If you want to savour some local food you can take a short trip to Udupi or Mangalore and return to Malpe by night. Overall we had an awesome time at Malpe and the amazing view of the sea made our trip unforgettable.